The latest issue of Tiki Magazine is on its way to people’s homes and select newstands and tiki sellin’ sorts of places. This is the first issue of Tiki Magazine’s second year (which means a bunch of you probably are due to renew your subscriptions! ), and the cover features Crazy Al and the absolutely astounding 7′ tiki he created for Tiki Lee’s guest bedroom, dubbed the “Tiki Lee Tree.” Inside, the centerfold spread is of Doctor Z’s home tiki bar, the Castaway Lounge. Doctor Z’s lounge is currently in boxes, as he’s recently moved. The Tiki Magazine profile serves as an historic archive of a happening spot, where many tikiphiles experienced Doctor Z’s legendary (and often all-night) parties. I myself actually got to live at the Castaway Lounge for a while. Doctor Z exhibited extraordinary trust and generosity when he let me stay with him when I first moved to California from Seattle — despite my not having a job lined up, and our having barely met before. The Castaway Lounge has a special place in my heart, and I look forward to seeing the spread. 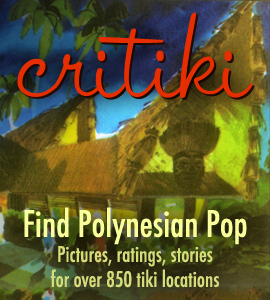 If you’d like a subscription to Tiki Magazine, or you’d like to advertise in it, visit the Tiki Magazine website.